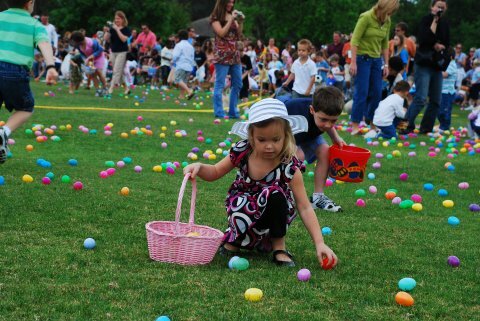 5 things you must know before your Easter egg hunt. I hosted an Easter egg hunt this past weekend to be the entertainment portion of my son’s birthday party. I was shocked to discover that my neighborhood squirrels sabotaged my plastic eggs filled with chocolate. They only sat outside for 70 minutes before we discovered with the children that squirrels will each right through the plastic and go after the chocolate. I will not lie, but I am beginning to really hate squirrels. They are become belligerent and rat like. In any case, I learned a few things this year after hosting my 4th Easter Egg Hunt. I had 300 eggs in total this year for my crew of cuties that arrived with baskets in hand. If you are planning on having an egg hunt this upcoming Easter Sunday, here are 5 things you must know beforehand. You must have someone guard the hidden eggs and run the squirrels away because they will eat the plastic get their nasty germs on the toys and the chocolate. It is actually cheaper to put money like nickels, dimes and pennies in the eggs than buy good chocolate for each egg. I did both, and I would have saved about $20 if there were coins in all of them. It is impossible to keep your kids from eating more chocolate than they should, money is actually better for everyone to find in the eggs. I’m doing 1/3 chocolate next year and 2/3 coins. Do not give your kids a big basket. Like with Halloween, the smaller the bag, the less they can potentially get. I did smaller buckets this year, because the eggs fill them up and when it gets counted in the end, it turns out to be only about 15 eggs each. Recycle your eggs for the next year. Spend the extra .50cents or so and get the plastic ones that are connected so when they open the top and bottom stay attached. This makes them easier to wash after the fact, and they dry more easily.